We formed Dream Team Prosthetics LLC in order to provide the highest level of care to our patients. Our number one goal is to help our patients achieve the best functional outcome possible; to live a fulfilled life utilizing advanced prosthetic technology. Our highly skilled team is ready to serve you and your individual needs by applying the most advanced techniques, materials and technology, to help you overcome your physical challenges. We are committed to working closely with your doctor, nurse, physical therapist and your family to provide you with the most appropriate prosthetic technology to meet your specific needs. Our clinical expertise extends to all amputation levels. We maintain a vast working knowledge of the latest prosthetic components and fitting techniques. Our clinical team is passionate about taking care of our patients and helping them navigate the prosthetic fitting process as efficiently as possible. Our approach is profoundly different than most practices as we focus on the individual and developing solutions that they can embrace in their daily activities. We have dedicated our professional careers; focusing our clinical skills specifically on the treatment of individuals with bilateral above knee limb loss. Each year, we see hundreds of bilateral above knee patients from all across the United States, and many travel to us from all across the world. Many have very complex limb amputations, short limbs, skin grafts and even upper limb involvement. This is a unique patient population that historically has been underserved by the prosthetics profession using traditional methods. We develop a customized treatment plan for each bilateral above knee amputee based on their individual level of function and limb condition. Our passion is to treat the most challenging cases and to meet or exceed their expectations with advanced prosthetic technology and education. Our clinical team maintains professional relationships with prosthetic component manufacturers and is regularly engaged to provide feedback about new product concepts. We are committed to helping manufacturers innovate advanced technology that will better address patient needs. We thoroughly evaluate and trial new prosthetic components; many times before they have even been introduced to the public. This gives our clinical team a unique advantage and deeper understanding of new prosthetic technology to provide the highest level of care to our patients. 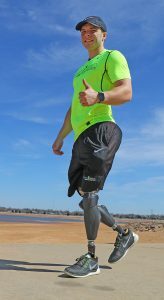 No matter what your level of limb amputation, you can be confident that Dream Team Prosthetics has the clinical skill and experience to help you achieve your dreams.